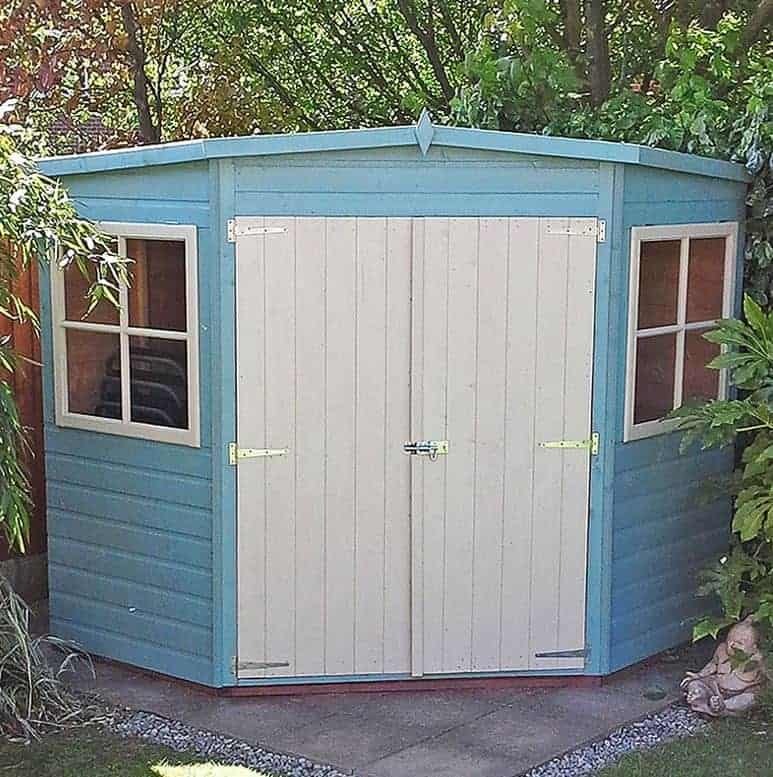 When space is limited, a corner shed can provide the perfect storage solution. This unusually shaped shed from the leading Shire collection benefits from an outstanding build. It focuses on quality, affordability and practicality. Even the pent roof has an unusual design, though it still enables you to erect the shed underneath low hanging branches and in front of buildings. There are two opening joinery windows included on either side of the shed. These benefit from an attractive panelled design and they open out from the bottom. What’s great about these windows is they are glazed with 3mm glass, giving them a more insulated and noise reduced design. 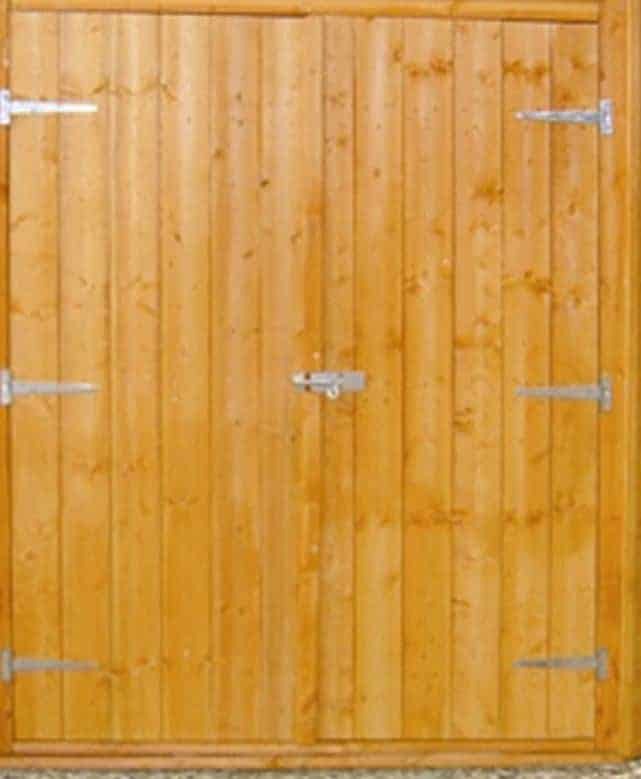 Double doors appear at the front of the shed, secured with a pad bolt. When installed in a corner these doors will be placed at an angle. They reveal a very wide entry into the building and have a very thick, solid design. What we really like about this model is the fact it also uses tongue and groove on the floor. If you’re unfamiliar with the different floor types included in modern sheds, this is basically the highest quality floor you will find. It basically allows you to store much heavier equipment than a solid sheet floor. No padlock is included which would have been nice to see in this price bracket. However, padlocks are relatively cheap to buy. 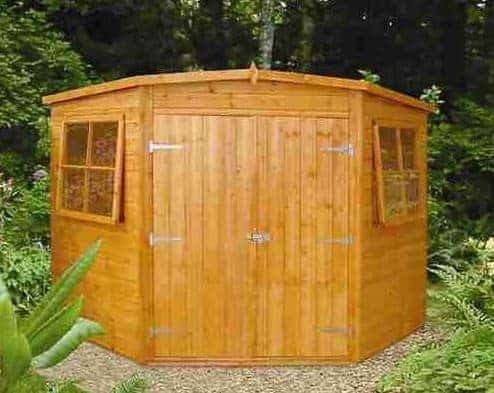 This is a rare corner storage shed with a generously spacious amount of room to store your gardening essentials. Though you can’t really see from the picture, this is a very tall building which is unusual for a shed with a pent roof. Even the door height is taller than what you’ll find on a lot of other sheds. The width of the doors is fantastic, offering a very comfortable access space for the transportation of bulky tools. The pent roof isn’t your standard pent design. The building has an almost hexagon shape and the roof has been adapted to fit this corner style. So whilst it still slopes from the front down to the rear, it does offer something a little different to its competition. The way it is designed means that similar to an apex roof, water will drain quickly off onto the ground. The floor of this shed has been designed a little differently to the roof in the fact it features a tongue and groove design. This gives it a fantastic amount of strength which makes it feel solid underfoot and makes sure it can hold heavyweight equipment. I f you’re looking for a more robust shed, this is an ideal choice. 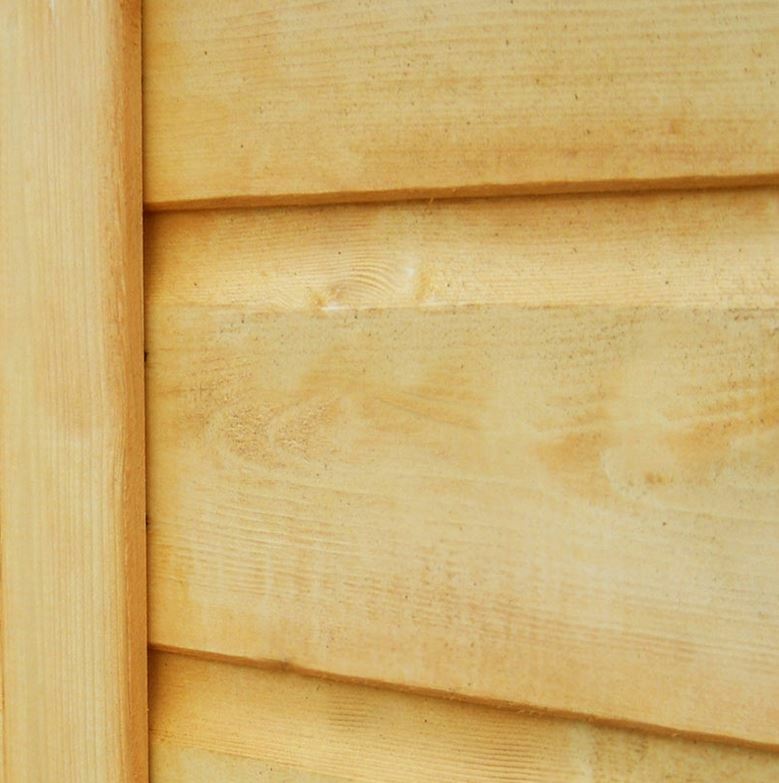 It uses the highest quality Shiplap tongue and groove cladding which is well-known for its rigid, weatherproof qualities. It has many benefits in comparison to overlap and isn’t prone to swelling or shrinking due to seasonal changes. The panels form a very tough interlocking design which doesn’t just add to its water resistance, but also to its protection against strong winds. 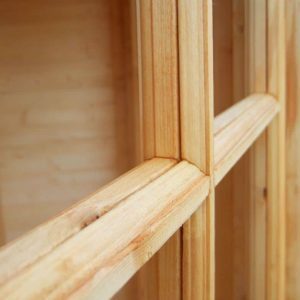 A robust 34mm x 34mm frame is used to protect the overall structure of the shed and it is created from Northern European softwood. Prior to being shipped the timber is basecoat treated at the factory. This is to basically ensure the wood doesn’t get damaged whilst it is working its way to you. However, this shouldn’t be substituted for a high quality treatment after assembly. 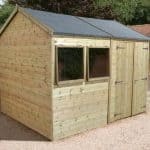 We highly recommend you use a good quality spirit based treatment once the shed has been erected and then each year afterwards to maintain its excellent weather resistant benefits. The doors on this corner shed dominate its design. They cover the entire front of the building and offer an extraordinary amount of width to get in and out of the shed. This makes storing absolutely anything a breeze. To make sure they don’t sag if used daily, the manufacturer has securely hinged the doors in three places. 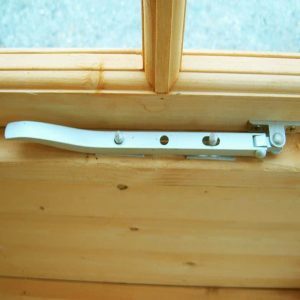 They also have a pad bolt to keep them closed securely even in the strongest winds. The two opening windows are also a brilliant part of the shed. They have a beautiful, panelled style and are both openable. 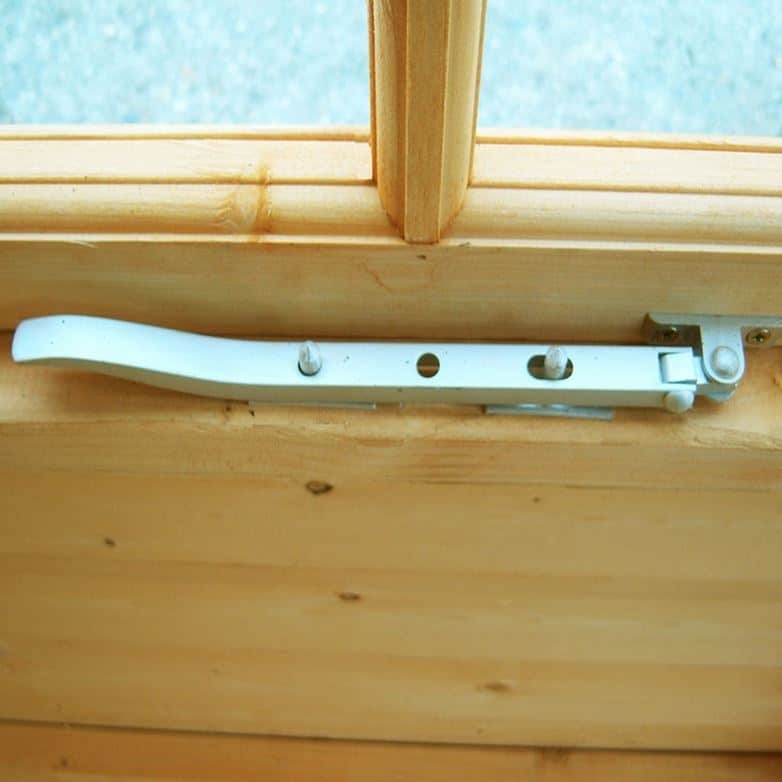 From the close up pictures found on the Shed Store site, you can see they also lock securely. As they are glazed with 3mm glass, they also provide a good amount of noise reduction and help to give the insulation of the shed a little boost, making it cosier to use in the colder weather. There are a lot of things to love about the design of this shed but sadly the security and privacy aren’t one of the main features focused on by the manufacturer. It is good to see that instead of a button catch, a strong pad bolt has been added to the doors. This means if you buy a padlock it is easy to make sure your storage is properly secured. The privacy is also limited as there is a window at either side of the building. You can add your own curtains however which will obviously help to keep the shed more private when not in use. 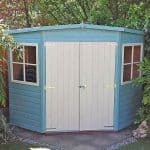 It is very unusual to find that Shed Store do not offer any extras with this corner shed. Whilst there isn’t much that could do with being upgraded, one particular thing that would be nice to see is a padlock. As mentioned, the doors are secured with a pad bolt. One of the benefits of this is that it provides you with a great place to install a padlock. Without one the shed can be accessed by anybody. So we definitely advise you to look for one on the Shed Store site when buying the shed. 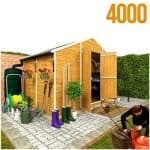 The shed comes in a Golden Brown colour which is different to most other sheds available. It means that you don’t have to buy coloured treatments. However, you could paint over the shed if you aren’t keen on the colour. This gives you a great way to customise the building to fit your preferences. An alternative colour choice can be found on the pictures featured on Shed Store. 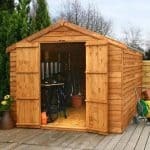 This shed oozes quality and you can see just by looking at it that it has a strong and solid design. 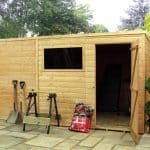 High quality timber has been used in the construction of this shed which means it does benefit from great longevity. You will need to add annual treatments to the building though so that’s the only thing to keep in mind. It is common for corner sheds to sacrifice interior space. This one doesn’t however so compared to similar models, it does provide more space for your tools and equipment. The unusual design of this shed does make it a little more difficult to build than most. For example, it is estimated that it will take around 6 hours to assemble. 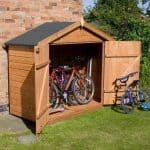 All in all there are things that could be upgraded such as the security, but this space saving corner shed does provide really great value for money overall. 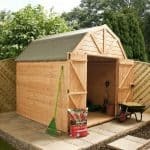 Final Thoughts: The space saving, unusually designed Shire Shiplap corner shed is a fantastic addition to smaller gardens. Designed so that it will easily slot into the corner of the garden, this generously sized building is equipped to handle even heavyweight storage. 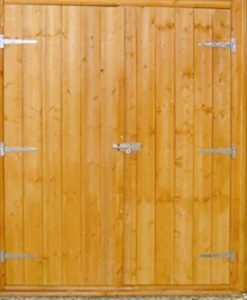 Double doors provide quick and easy access into the shed, whilst the tongue and groove floor ensures it is sturdy and safe to walk over. 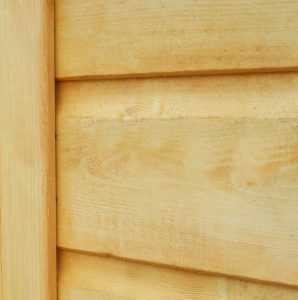 The two windows located on each side of the shed are one of the highlights of this model and they benefit from an extremely stylish panelled finish. They are also glazed with a thick 3mm glass so you experience reduced noise and increased insulation compared to thinner windows.